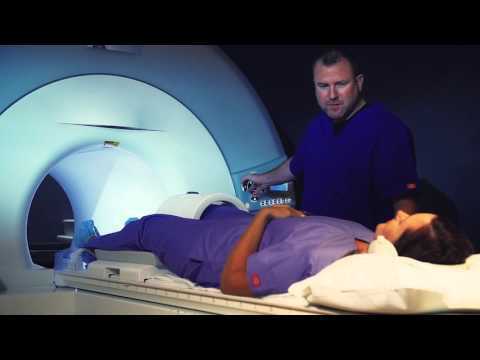 Magnetic Resonance Imaging (MRI) is a diagnostic technique that uses a combination of magnetic fields and radio waves to visualize structures within the body with improved clarity and resolution. The procedure is entirely noninvasive and usually no patient preparation is necessary. The exam lasts 30 to 60 minutes depending on the body part being scanned and is usually divided into 3 or 4 imaging segments. One of the great advantages of the MRI system is that no x-rays are used. Tests with these magnetic fields and radio waves that are used in this imaging system have been performed over the last forty years and have shown no harmful effects. The most common exceptions to this are in patients with pacemakers, internal defibrillators or brain aneurysm clips; these usually cannot be scanned in the MRI system. Scans requested on pregnant patients should be discussed with the radiologist. In some instances, a contrast agent (gadolinium DTPA) will be administered when requested by the referring physician. All MRI studies require a written prescription or referral stating the exam being ordered and the medical necessity of the procedure. If the patient is claustrophobic, sedation may be necessary. I.V. Sedation is available at our East Brunswick office on request. Arrangements can also be made for the patient to speak to our nurses and visit the office prior to the exam to see the equipment and learn about the scanning procedure. All patients must be screened for the presence of a cardiac pacemaker or brain aneurysm clips, history of metal in the eye or metal implants. MRA is an MR scan that images the blood vessels. This scan is usually done with the injection of a contrast agent. It is usually performed to find aneurysms, arteriosclerosis, and/or abnormal narrowing in blood vessels. MRI study of the gallbladder, biliary system and pancreas. Evaluates for gallstones, pancreatic abnormalities and bile duct abnormalities. MR Arthography involves the injection of contrast into a joint followed by an MR scan of the joint. It is used if non-contrast MRI is equivocal, with certain types of injuries or if the patient has had a certain type of prior knee surgery. MR Spectroscopy is a special type of MR imaging that uses additional scans to help determine the specific tissue types that comprise a mass or lesion. It is usually used for mass characterization in the central nervous system.